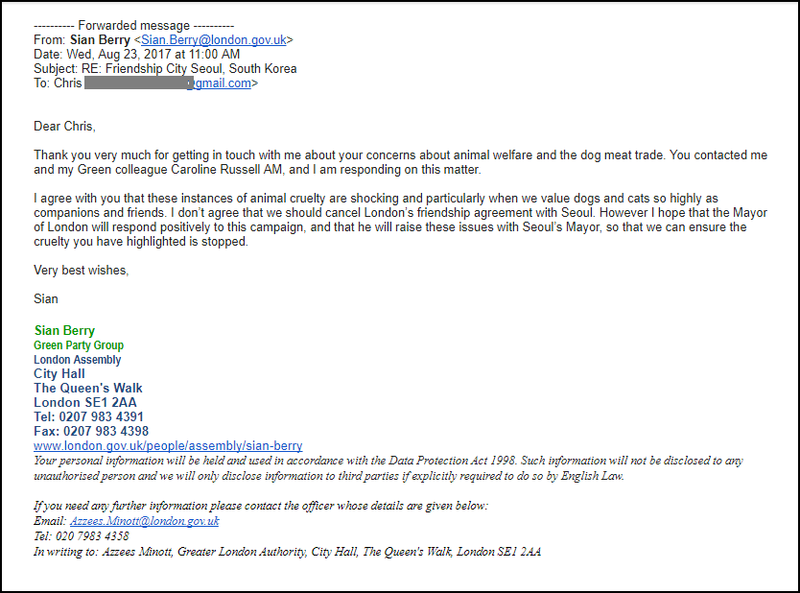 [Update August 23, 2017] Received a supportive response from Ms. Sian Berry of London Assembly. [Update August 14, 2017] Received another response from Public Liaison Office. The Mayor of London, Sadiq Khan, has responded to our petition through his Public Liaison Team. In the response, it seems that they are confused that we are petitioning about an event in Korea where the dog eating is practiced. 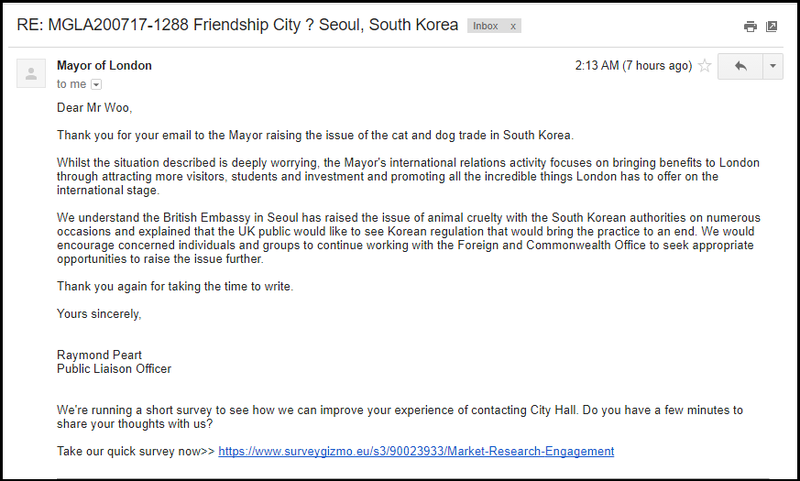 We assume that they intended to address our petition urging London to speak out against their Friendship City, Seoul’s dog meat cruelty. In the response, he says “I am sorry we cannot help”; but it seems as though his City is supportive of our campaign by saying that they have “no plans to deliver a Korean Festival on Trafalgar Square this year” and they have not “received any event proposals from external event organisers”. 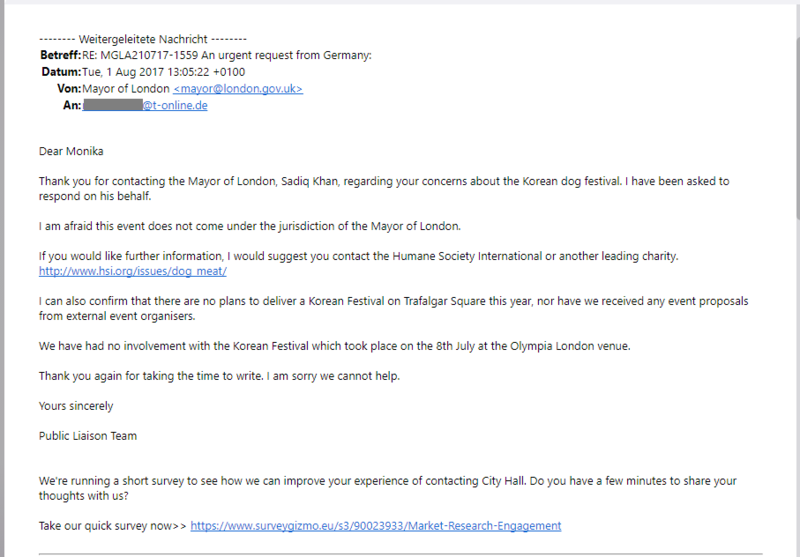 The Mayor also states that the City of London, “have had no involvement with the Korean Festival which took place on the 8th July at the Olympia London venue.” I can say that our campaign is a success. What do you think? What we do matters and it makes a difference. So please don’t give up and keep up the great work. 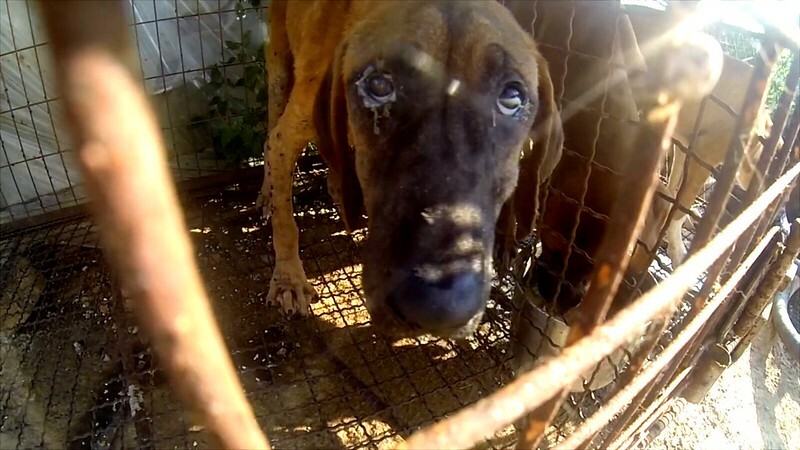 Thank you, Mayor Khan and we hope that you will change your mind and speak out for these poor Korean dogs someday. Thank you all the supporters who have taken action. We would like to thank you for taking the time to respond to our petition request; your response means a lot to us as the plight of these animals is of great concern to our many supporters. We are heartened to know that there are no plans to hold a Korean festival on Trafalgar Square this year and we feel sure you agree that the citizens of London would not wish to celebrate a culture which endorses animal cruelty and abuse, and which turns a blind eye to the health hazards caused to its citizens by all aspects of the aberrant dog meat trade. Thank you again, and we respectfully ask that you bear this issue in mind when liaising with your Korean counterparts on friendship city matters. Sorry…we cant help???? That is NOT good enough…is it? He is supposed to represent the people of London. But having said that not all of us here in London love and respect animals and we have be sure that who we are approaching has the same compassion as we do….just a thought eh? and NO this id NOT a racist comment at all…just think about folks…as know that we dont all think the same so we have to have people on our side who WILL support the noble cause. We as a nation…let alone London should not be supporting these barbaric peoples in any way whatsover. In sport ..festivals…merchandise…ANYTHING. The mayor of London SHOULD take on this mantle and show that this city does has compassion for animals…if some people dont then they should be strongly encouraged to do so(if I had my way it would be compulsory) HE should lead the way and be the beacon. To say …sorry cant help… to me is disgusting. Shame on you …but then I for one didnt really expect anything else. why should my comment be doctored? How dare you. We should be able to say what we think . Friends, it is more obvious than ever that we must keep on repeating our message, this madness and torture must come to an end.